Why Your Ducts Get Dirty & The Top 15 Reasons To Clean Them! Americans spend 90 percent of their time indoors breathing air that is confined within a heating and air conditioning system. At most workplaces and homes, the windows are rarely opened so air quality can sometimes be worse indoors than out. One of the most important actions homeowners can take is to change their furnace filters regularly and keep their HVAC system properly maintained. Air duct cleaning is also important because it removes all air-borne dust and debris from the air duct system components of the HVAC, forced air systems, gravity heaters and other related systems. In addition to mold removal, which we have written extensively on, one of the core services First Call NY provides is air duct cleaning. This is the ideal time to clean your ducts. We follow the standards and best practices recommended by the National Air Duct Cleaners Association (NADCA). The purpose of this article is to explain why your ducts get dirty and the top 15 reasons why you should have your ducts cleaned. Your heating and cooling system is the lungs of your home because the system takes in air and breathes it out. One of the primary reasons you should be concerned about keeping your ducts clean is that it can affect the indoor air quality in your home. 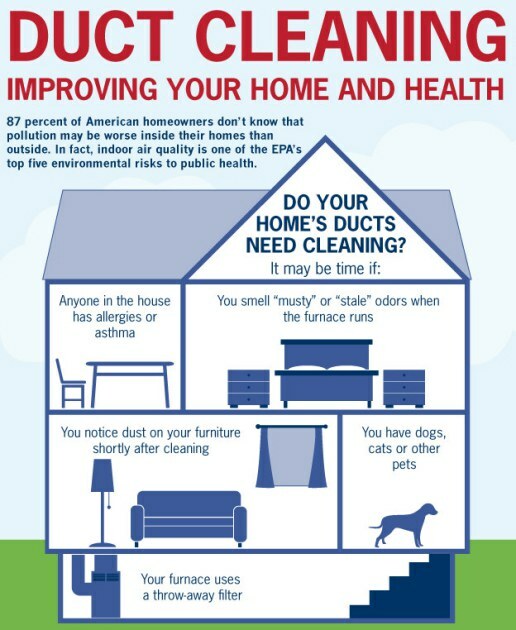 In a typical six-room home, up to 40 pounds of dust is created annually through everyday living. In addition to dust, through normal occupation in a home, we generate a great deal of contaminants and air pollutants, such as dander, dust, and chemicals. These contaminants are pulled into the HVAC system and re-circulated 5 to 7 times per day, on average. Over time, this re-circulation causes a build-up of contaminants in the duct work which in turn can affect the indoor air quality of your home negatively. The video below explains why your ducts get dirty. The remainder of this article will list 15 common reasons you should get your ducts cleaned. When your ducts become contaminated, your heating and cooling system works harder, which cuts down its life span. Clean air ducts increase the efficiency of your heating and cooling systems which should lower utility bills and increase money saved. A lot of homeowners have never even considered cleaning their ducts leading to years of build-up. If you have lived in the home for more than five years and never had the ducts cleaned, now is the time to get it done. You may have a wet, soggy or flooded crawlspace/basement that may have allowed growth of mildew and mold, which may have further penetrated in your HVAC duct system. The last thing you want are those spores circulating around your home. If you suspect that you have mold in your home, you may also want to consider a mold inspection as well. The duct system is an ideal breeding environment for bacteria, mold, fungi, and other allergens. These allergens cause respiratory discomfort and allergies and can impact the children and elderly more because their immune systems may not be as strong. Pollutants are brought indoors because of their microscopic air borne properties and then introduced into your HVAC system via the “cold air returns” contaminating the air. Duct systems also provide the perfect environment for dust mites, fungi, bacteria, molds and other allergens to breed. For instance, dust mites like to breed in temperatures that fall between 72 and 86 degrees. 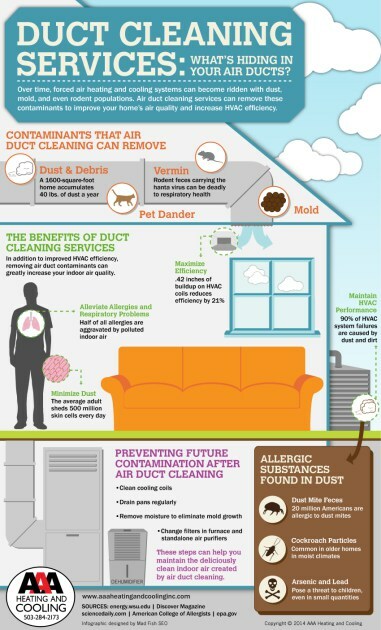 Cleaning your ducts will reduce allergy symptoms and improve the indoor air quality of the home. Up to 40 pounds of dust can accumulate in a six room house annually. Air duct cleaning will remove the dust that has accumulated over the years so that it does not keep circulating back into your home. You have installed a new furnace. The installation procedure is often quite messy that allows accumulation of dust and pollutants, which enter the living space once you start the system. You have pets in your home. Pet fur has the tendency to get caught in the air vents, which provide fungus, germs, molds and allergens the right place to live on. You had your Furnace and Air Duct System cleaned by a cleaner who simply “Blow’s and Goes” doing an unsatisfactory job. Some cleaners utilize portable cleaning equipment they pack inside your home and assemble, potentially cross-contaminating your household from a previous job. Hire an air duct cleaning company with a truck mounted system to prevent cross contamination. Your property recently suffered damage from a water or fire loss, such as a burst pipe, ground water, sewage back up, slow leak, or high humidity levels. Abnormal moisture levels, no matter how big or small they seem, can potentially cause significant air pollution because of mold spores or other contaminants caused by water damage. If you recently purchased a home, it is a good idea to have the ducts cleaned particularly if the previous owners had pets. The other reason, the home may have never had the ducts cleaned. We recommend that you get the ducts cleaned before moving in. Home remodeling and renovations can stir up dust and also release drywall dust into the air. Dust and debris from construction takes refuge inside the HVAC systems and begins recirculating. To avoid this, get your ducts cleaned immediately after the renovation is complete. The ducts in your home are the respiratory system of your home. 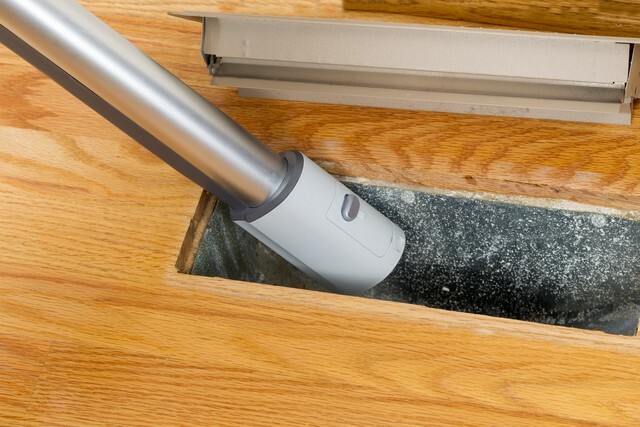 When you smoke, the ducts of your home will get clogged and dirty, reducing their efficiency. If you must smoke, we recommend that you do it outside to avoid the negative impact on your ducts. If you notice that your home has more spiders, insects, and other creepy crawlies, they could be living in the ducts of your HVAC system. In fact, spring duct cleaning is recommended because insects love to hide in the duct work to avoid the cold. Cleaning the ducts will remove the dead insects and also prevent further infestation by stopping the life cycle. If you notice an odor coming from your ducts or have allergic reactions, this could be an indication that there are dead mice, rats, or other animals in your duct work. Dead insects and animals can have a negative impact on your indoor air quality. A thorough duct cleaning and disinfection of your ducts by a professional will address this problem. Got Questions About Duct Cleaning? Duct cleaning is typically not a priority maintenance item for many home owners. As this article shows, however, there are many valuable benefits to having routine air duct maintenance and cleaning services performed in your home. If you’re not sure whether the air ducts in your home need to be cleaned, have ever been cleaned, or the best time to clean your air ducts, give us a call, (845) 226-0868. We are here to help with all of your indoor air quality needs. We do mold remediation and duct cleaning in Poughkeepsie, Hopewell Junction, Newburgh and all nearby counties. What Is In Your Air Duct System Summary! « Bleach and Mold: The Facts!